Audiences around the globe enjoyed all the action of the 2016 Summer Olympic Games thanks in large part to the drones hovering above the events (or below them), capturing every movement, from every angle. Athletes and spectators didn’t give a second thought to the presence of these drones — which shows how rapidly they’ve become commonplace. Indeed, drones can be found in almost every industry. For years, the military has used drones, which they refer to as Unmanned Aerial Vehicles/Systems (UAV/UAS), to get a birds-eye view of complex operational missions and perform intelligence gathering. And recreational use of drones has soared, as individuals use them to take aerial photographs, explore, race, etc. (In January 2016, only 30 days after the U.S. Federal Aviation Administration issued a new rule that required drones to be registered, hobbyists had registered more than 181,000 drones). More recently, however, drones have come onto the radar of commercial enterprises and public sector agencies as a way to help them tap into new opportunities, improve services, increase visibility and cut costs. The media and entertainment, mining, oil and gas, retail, construction, agriculture and real estate industries, among others, have already successfully put drones to work for them. City and state governments, first responders, educational and environmental agencies, etc., also have started identifying ways to use drones to enhance their capabilities and efficiencies. As a result of the many potential applications, the Association for UAS International estimates drones could create 100,000 jobs and generate $82 billion in economic activity over the next 10 years. Given Israel’s pioneering work with military drone technology, it is no surprise the country is the biggest military drone exporter in the world, supplying almost 61 percent of the drones sold since 1985. Commercial drones are a natural extension of Israel’s strong defense and aerospace industries, which are led by global visionaries such as Israel Aerospace Industries, Elbit Systems, Rafael and Aeronautics. Israeli aviation, robotics, autonomous systems and computer vision experts have been taking their military experience and translating it into commercial applications that companies, such as Amazon, Google, Facebook and DJI are implementing to the benefit of the overall civilian drone industry. As new drone applications are identified, Israeli experts are optimally poised to deliver the military-grade capabilities needed to succeed. We, as seed investors in many of Israel’s technology startups, have seen firsthand the explosion of Israeli drone companies. In fact, there are close to 40 Israeli commercial drone startups addressing a variety of needs for a wide range of sectors. The overwhelming majority of the companies were established in the last two to three years. Interestingly, 42 percent of these early-stage companies have secured capital, totaling $80 million. 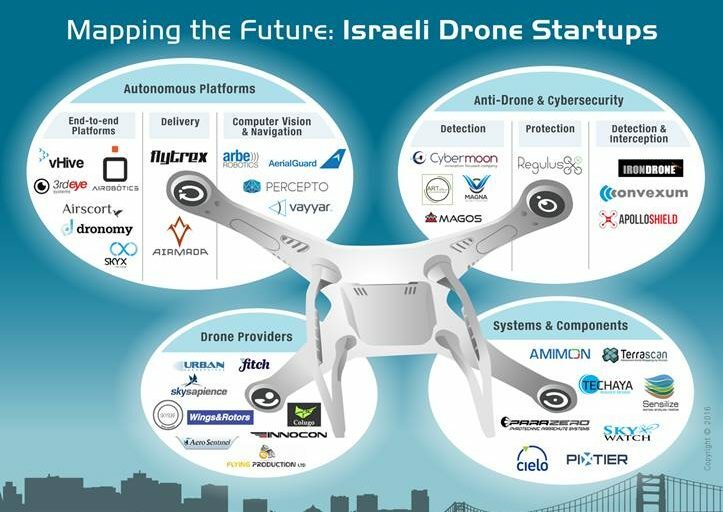 In general, the Israeli commercial drone startup ecosystem can be divided into four main categories: autonomous platforms, anti-drone and cybersecurity solutions, systems and components and drone providers. End-to-end autonomous platforms are the future of the commercial drone industry. They enable drones to complete activities without needing any human intervention. Israeli startups are leading the world’s development of autonomous capabilities. For example, they are creating drones that deliver packages to their destination and intelligent navigation and advanced computer vision technologies that identify and circumvent potential issues. Israel’s deep military and defense expertise puts Israeli entrepreneurs at an advantage. Some of the companies to watch in this category include Airobotics, Flytrex, Arbe Robotics and AerialGuard. Airobotics recently emerged from stealth mode and raised a substantial amount of capital; the company is developing an autonomous drone capable of recharging its own batteries. Flytrex offers a drone for parcel delivery that is already operating in five countries. Arbe Robotics, the winner of the TechCrunch Tel Aviv Pitch-off Competition, and AerialGuard, the runner-up in the 2016 Global Innovation Awards, are focused on developing intelligent navigation and obstacle avoidance systems. There are risks created by drones that need to be mitigated. To ensure safe, appropriate usage, regulatory bodies are requiring individuals and commercial entities to register their drones. This is only a first step, however. The public needs to be protected from unregistered, “rogue” drones, and the drones, themselves, need to be protected from hackers trying to tamper with, disrupt or, in extreme cases, take control over their operations. Israeli entrepreneurs, renowned for their defense and cybersecurity expertise, are developing systems that can intercept drones that pose a threat to public safety and prevent attacks that attempt to use a drone to carry out an exploit. Companies to look at in this category include ApolloShield, Cybermoon and RegulusX. ApolloShield, a recent Y Combinator accelerator participant, is developing an anti-drone system capable of detecting and intercepting drones. Cybermoon offers a detection system that uses an advanced audio analytic algorithm to locate drones. RegulusX, a finalist in the 2016 CYBERSTORM competition, is building a protection solution for drones that encrypts communications and detects jamming attempts to ensure the integrity of their operations and safe usage. Varied use cases require varied drone capabilities. To meet this market need, startups are emerging that offer different drone systems and components. The offerings can be almost anything, ranging from sensors and communication solutions to 3D mapping and drone insurance platforms. Examples of companies in this category include ParaZero and Sensilize. ParaZero is developing a recovery system for malfunctioning drones, in the form of a parachute, and Sensilize is creating a multispectral sensor for agricultural applications. Specific drone applications have given rise to specialized drone providers that can offer solutions tailored to fit a particular industry’s needs. For example, inspection drones, agricultural drones and disaster recovery drones. Examples of vertical drone providers include Fitch, Sky Sapience and Colugo Systems. Fitch is developing the first ever drone for fishing, Sky Sapience is creating a drone suited for security and safety applications and Colugo is designing a lightweight, low-power-consumption drone for delivery and inspection purposes. All these commercial drone technologies are driving new and exciting applications. We feel Israel’s deep military and defense expertise puts Israeli entrepreneurs at an advantage, giving them the highly valuable skill set needed to introduce military-grade capabilities that can grow and enhance the value of the drone market. Thanks to Israeli innovators, we expect to see many more use cases for drones that can benefit us all.